It seems Hollywood is the one place on the planet where no idea is too awful not to be given serious consideration, and more times than not, a green light and a budget. And when the news of a flick that would pit the hockey mask-wearing, machete-wielding homicidal maniac against the burnt-up, knife glove-wearing, one-liner phantom that haunted the kinder's dreams in a cage match presumably to whatever passes for death for these two, the howls of derision from both fan camps could be heard all the way to the International Space Station. Neither group felt their horror legend should be sharing screen time with that other...thing, which didn't hold a candle in terms of sheer terror and inventiveness to their chosen icon. The general feel was that New Line, which had the Freddy Krueger franchise from the beginning and which acquired the Friday the 13th line near what most everyone figured was the end of that franchise's life, was looking for a way to milk a few more bucks from their cash cows before the carcasses were well and truly stripped of anything even approaching a worthwhile meal. Because against what would seem to be all reason, Freddy vs. Jason turned out to be one hellacious E-ticket ride from very near the beginning to its somewhat ambiguous, open-for-a-rematch/sequel end. What's more, both fan camps had ample reason to be pleased by the film's portrayal of their favored idol; both Jason and Freddy were completely true to form, yet the depictions also broke new ground and added to the mythos of each of the eponymous characters. The premise of Freddy vs. Jason is simple. Seems the adults of Springwood have discovered Freddy's secret: He can only continue in this plane of existence so long as the children remember and are afraid of him. So a systematic cleansing of all things related to Freddy is carried out, and any child or teen who has dreamt of the scary burned man in the fedora is sent to the local loony bin and dosed with an experimental drug that halts dreams. The film opens four years after this erasure of Freddy has been done, and the result was complete success: no one in Springwood has died a mysterious and violent death in their sleep, and the children have no idea who Freddy Krueger is, nor any reason to fear him. But our friend Freddy isn't going to be kept down for long, and he hatches a plan to escape from Hell and return to what he views as his rightful place in the nightmares of the kinder in Springwood. To accomplish this, he enlists the aid of Jason Voorhees, he of the hockey mask and machete. Apparently one of the 75 "Jason's gone for good" flicks succeeded in actually killing the guy, because Freddy has to raise him from the grave to wreak havoc in Freddy's name. Somehow Jason's killing spree will remind the kids of Freddy , thus opening the door to his triumphant return to Springwood to once again kill at will and spout one-liners. Jason does his work well, unwittingly aided and abetted by two former residents of Elm Street who were among those locked in the insane asylum because they had seen and heard of Freddy; the boys escape when they hear about the first killing, fearing Freddy is back and will harm their friends. So everything goes according to Freddy's plan...until Jason decides to branch out on his own, taking some of Freddy's kills in the process. Thus the epic battle promised in the title begins, with the young residents of Springwood caught in the middle. 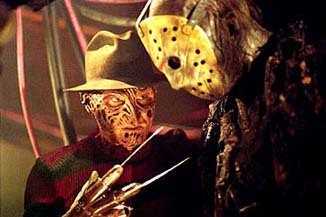 Of course, most of the fun in these films derives from the ways in which Freddy's - and Jason's - coming for you. I've long held that this is the underlying weakness of the slasher genre. Once you've seen a half-dozen or so slasher flicks, there just aren't any new ways of killing human beings; you've seen it and seen it, and the conventions of the genre eliminate almost any element of surprise that might derive from the nubile teens-in-jep scenarios. Which is the reason why I, at least, have always preferred the Elm Street franchise to Jason and his ilk; Freddy is a much more interesting character in his own right than any of the slasher villains, and the way he toys with his prey is far more entertaining than anything the slice-and-dice folk can dream up, focusing as they do on the actual kill. But this possible weakness - Jason handles all the early kills in the film - turns out not to be of pressing concern; there are some spectacular kills in Freddy vs. Jason, and by framing much of Jason's work in Freddy's milieu, there is the added fun of seeing how the victim is being lured to his or her ultimate doom, which is far more imaginative than the run-of-the-mill, "Oh, I hear a strange noise and my friends are mysteriously disappearing; I think I'll enter this dark room, not turn on the lights and investigate" provided by your basic slasher (My personal fave here is the bloodier version of Hufnagel-on-the-Half-Shell). There's also the side story of the dream-suppressing drug, which is a fascinating idea that could have made for another intriguing dimension to this film, had it not ultimately been reduced to a plot device, albeit an important and interesting one. The other big attraction in this flick is the titanic battle of the title idols, and I commend the film on setting this up well from both the teens' and the combatants' standpoints. And while I wouldn't dream of giving away the ending, I will say that the movie's tagline of "Only one will survive" is a tad disingenuous, something I suspect any long-time horror-movie fan already reckoned on going in. Freddy vs. Jason's action-packed 97 minutes flies by, and the down time between the kills is filled with some surprisingly well-written character bits for the main actors, harkening back to the first Nightmare on Elm Street film in establishing relationships and creating people you care about seeing survive until the end. And we learn just a bit about the main villains we didn't know before, too, including what scares them. Out of what could well have been an unmitigated disaster (yes, Alien vs. Predator, I'm looking at you) director Ronny Yu and scripters Damian Shannon and Mark Swift have crafted a tight, fun-filled popcorn flick that will delight both staunch Jason supporters and steadfast Freddy friends, as well as folks who've never seen a film in either franchise (if such deviant creatures exist). It's a lot of fun, a lot of gore and a liberal dose of humor, and more than worth picking up on your next trip to your local video rental emporium.